There's an old R.E.M. song called "Don't go back to Rockville." It's a catchy, country-style tune that describes Rockville, Maryland, with lyrics such as "Going where nobody says hello/They don't talk to anybody they don't know" and a chorus that states, "Don't go back to Rockville/And waste another year." Surprisingly, the song is not included in the city's tourism videos. That tune was running through my head as Jennifer and I took Kyle to Rockville this past weekend for a wedding on Jennifer's side of the family. This was Kyle's first wedding; he's normally not invited to these things because he doesn't like sitting still for long periods of time and he's been known to strip in public. The bride and groom wanted Kyle there anyway, and told us that some of the other guests had the same habits (most of them babies). So, when we arrived in Rockville Friday night, Kyle fit right in. To my surprise, Rockville was much different than the place I had imagined after humming that song. There was no feeling of gloominess, no factory to enslave our child, and the people there actually said "hello." Instead of dark, empty houses and hordes of people trying to bring me down, there was a plethora of cheerful shopping plazas, complete with the essential Starbucks, cell phone shops, and discount mattress stores. The biggest problem with Rockville these days might be the actual "going" part. There may be a curse on any travel to the city. It's not one that can ruin a weekend; we had a great time, in fact. It's just a curse that makes things awfully inconvenient. It began with our arrival. We reached the hotel around dinnertime, and we were starving. The little guy was so hungry he started to eat parts of his stroller. Jennifer and I immediately searched for food, and Jennifer's grandmother recommended that we go to the hotel's restaurant. She said it was quiet and empty, and the perfect spot to take the little guy in case he acted up. So we took the elevator down to the restaurant and found out that there was a good reason why it was quiet and empty: it was closed. Apparently no tourists like to eat dinner on a Friday night. We went back to the room to give Kyle his food, along with the milk that the hotel staff gave us from their closed kitchen. We had no other milk because we hadn't gone out to buy some yet, and neither the hotel's gift shop nor vending machines carried it, since people visiting Rockville tend to put their children in a kennel. We were extremely grateful that the hotel came through to quench our child's thirst. After that, it was time to find more milk for the weekend, and food for ourselves. We first tried to go to a Target store, which the concierge said was in walking distance, right behind the hotel. It turns out the Target was in walking distance only if you were planning to walk for the rest of the night. We drove a good number of blocks to get there, only to give up on our plan to go inside the store when we couldn't find its entrance. By now my stomach was starting to eat itself. We went to a nearby supermarket, which sold milk, snacks, and prepared food - that needed to be heated. When I asked a worker if there was any way the store could heat it, she laughed at us and told us to use our hotel room's microwave. When we told her our hotel room didn't have a microwave, she laughed at us again, and then went on and on about how she always reserves rooms with microwaves in them, and how crazy we were for not getting one. She had a lot more to say, but we didn't stick around to hear it. Since it was getting past Kyle's bedtime, we decided we'd cave in and order room service. After the long day, we figured nothing would go better with the room service meal than an ice cold beer. They don't sell beer in the Rockville supermarkets, so on the way back to the hotel we stopped at a nearby package store to pick some up. Of course, they didn't sell cold beer, but why would they? Nobody wants cold beer in Rockville. The rest of the weekend was certainly better. Kyle did well at the wedding. He had fun going to the wedding and seeing his relatives, but most of all he enjoyed seeing himself. Turns out we have a narcissistic baby. Who knew? This was the first time he was in a room with a mirror at his height, and he spent a lot time gazing at the handsome face looking back at him. The inconvenience curse still haunted us, too, but not as severely. It mostly struck whenever the little guy tried to nap. The first time he tried to snooze, he was rudely interrupted by the wedding itself. The second sleep attempt was at the post-reception cookout, when Kyle was awoken by a massive rush into the house, as the weather suddenly changed from overcast... to hurricane. Overall, we had a great time in Rockville, despite the warnings from R.E.M. and the inconvenience curse. On the way home we hit heavy traffic that delayed us several hours, and we even had trouble finding whole milk at one of the rest areas (Burger King sells only skim, believe it or not). But we don't blame the curse for that. No, it's just one of the things you come to expect when you're forced to drive through the abyss known as New Jersey. That whole "new crib" thing isn't quite working out like I hoped it would. The plan was to have Kyle sleeping in his new crib by today, with the old one in pieces and its parts starting a fantastic journey back to its manufacturer, who, in turn, would send us a voucher to pay for the new crib. Instead, right now Kyle is sleeping in his old, recalled crib, and the new crib is back in pieces and in its box, ready to be returned this week. Let's just say it wasn't a fun weekend. Things started off well. The crib took just a few hours to put together, and it probably would have taken a lot less time had I been able to use real tools, instead of a tiny, bent strip of metal called the hex key. It's called a "hex" key because it puts a hex on your thumbs, making them completely numb and useless for hours after using the tool. Otherwise, it was a rather harmless operation. I don't think the designers of this crib were expecting any child to go there. 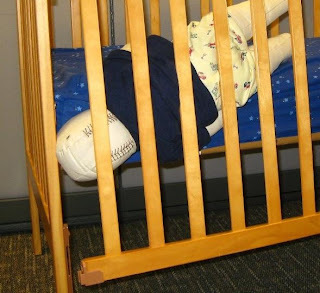 The rocket scientists at Delta Enterprises, the company behind this crib, must have tested the device using a stationary baby doll. They probably figured that real babies also don't move much, so they could make the crib lower than usual at the front corners, with the sides and front at equal height so that, say, a 13-month-old child could easily put his arms around them. They then came up with a brilliant idea to have the crib's slats connect at that point, creating one "mega slat" that would be wide and sturdy enough for the feet of any, say, 13-month-old child, making it super easy to climb. But really, these designers must have thought, what kind of crazy 13 month old would want to do that? Cribs are for sleeping, not for climbing! They probably patted each other on the backs, having designed another beautifully stylish crib, and then, to celebrate, went out for an afternoon drink at the same place where they got their morning shots of hard liquor. Our child loves to climb. He has a history of climbing out of things, going way back to three days ago. That's when, as we were all laughing, clapping, and uncorking the champagne, Kyle flung his arms over the corner and raced his feet up the corner slat, to a point where his head and chest were up over the edge. Our child paused there, still smiling and laughing, just a few steps away from flipping himself head-first out of the crib. He was fully capable of doing so. 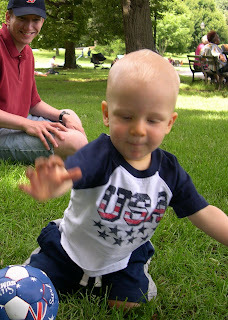 While our son was blessed with strong arms and legs, he does not yet appear to be blessed with a fear of gravity. He could not understand why our faces turned pale as we ran to him, no longer laughing but saying very loudly words he did not know. It's this lack of understanding that led him to try this stunt several more times after his parents pulled him from the edge. The hex key soon came back out, and I began disassembling the crib I had just assembled. We had done everything right. The crib was assembled correctly, and the mattress was at its lowest setting. Yet, when I measured it, the Delta crib's rail was a full inch lower than the old crib's, putting it at Kyle's chest, and making it easier for him to fling himself out. Eventually Kyle will be big enough to climb out of any crib. Here's hoping that, by then, he'll also be old enough for a toddler bed. 13 months is still way too young by most standards... unless, of course, you go by the standards of medieval times, back when 13-month-old kids would work on the peasant farm and have children of their own. So, for now, Kyle is back in the recalled crib, which feels safer than the Delta crib (it's the Venetian Convertible 4-in-1 model, for those of you who may be thinking of having a child that actually moves around). We're going back to Babies R Us on Thursday morning to return the Delta crib and hunt for another model. I have a dentist appointment set for next month. I'm beginning to wonder which trip I'll enjoy more. 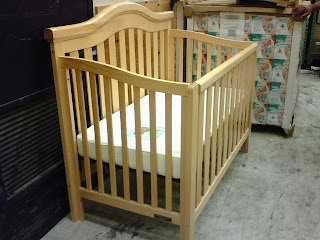 On Sunday our little family went to Babies R Us to purchase something we already have: a crib. Why? Well, you simply can't have enough cribs, and our mission is to fill the whole apartment with them. That way, when Kyle learns to crawl out of one, he'll just land in another. Sure, it will be hard to host parties or walk to the bathroom, but at least the little guy won't be able to escape nap time, and that's essential for his dad's sanity. The Consumer Product Safety Commission has a flair for the dramatic. No doubt a picture like this can worry a parent, even if the doll has a head that looks like a baseball. The CPSC might want to consider changing that to make the picture more effective, and perhaps have a pet dog chew on the doll to add a sense of urgency. Still, the image above is rather disturbing as is, and after seeing it, I checked to make sure our crib was not part of this recall. Fortunately, it was not. Instead, it was part of another recall (doh! ), one that didn't have a dramatic picture associated with it. There's just a brief note saying that because one of the 96,000 units sold caused a child to suffer minor injuries, all of the cribs should be destroyed. Our son may be cursed. It seems that anything he sleeps on eventually will be deemed unsafe by some bureaucratic institution. It's already happened once before: the portable crib/playpen seen to the right, his bed during the first three weeks of his life, was recalled this past winter because its sides could collapse. That's a problem when your rather hyper child likes to body slam against the sides, and tugs on them so rapidly that the whole playpen moves. While we didn't like dealing with this recall, getting the money back was rather simple: we followed the instructions, cut up parts of the crib and sent them in, and a few weeks later we received a check in the mail. We used it to buy a new portable crib, which is safer, except for the rotating-knife mobile that came with it. So now we're dealing with a new recall, and this weekend we searched for a new crib for Kyle. When I called the crib's manufacturer, they told me we'd get reimbursed only if we buy our replacement crib at Babies R Us. That was no problem, except for the fact that we bought our now-recalled crib at Babies R Us, and it was the only one there we liked. The selection at Babies R Us was just as we remembered it. Few of the cribs matched our nursery. They either looked too cheaply made or too big and stately that you'd expect the baby to have his own personal butler (besides his dad). There really wasn't anything in the middle. I thought I'd have better luck going online, but I soon learned from the store's friendly customer service that I wouldn't be able to use the manufacturer's voucher with an online purchase. That's because I'd have to go back to a store to get the money, and the store computers don't talk with the online computers. It's like they're two completely different companies. With this kind of efficiency, you'd expect Babies R Us to be at least partially owned by the government. So, with our heads down low, we went to take another look at the cribs. Just then the head of the furniture department pulled us aside and in a hushed voice said he had just put together another crib that was not on display yet. He led us to the Babies R Us equivalent of a batcave, where we saw the "secret" crib. Jennifer and I were overwhelmed by its sturdiness, lack of frills, and natural wood finish. We knew right then and there that finally we found the one basic crib at Babies R Us that we somewhat liked, so we took it without hesitation. We have teething guards, and you can be sure they'll be on the new crib after it's built. Once this is all done, it will be on to our next recall: Starbucks wants our bean grinder back (this is true). Turns out there's a "laceration hazard to consumers." I guess a grande Cinnamon Dolce Latte with an extra shot of espresso doesn't taste as good with a piece of finger in it. Let's just hope that this recall is easy to handle. Kyle probably will like fireworks years from now, though I doubt he'd enjoy them today. I can’t imagine a fireworks show being a pleasant experience for a baby. Just think of what it must be like: you’re still new to this planet, you don’t understand most words your parents say, and one evening you're in the middle of a crowd of strangers, looking upwards at what seems to be an attack from outer space. Explosions rattle you as the sky bursts with color. Flames fall down towards your head, and you turn to your only protection - your parents - but they don't heed your concerns. They just point to the sky, smiling and laughing, and you start thinking they must be on crazy pills. 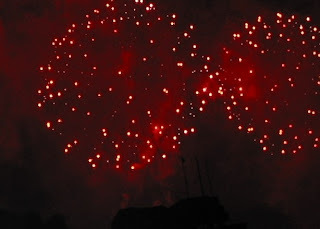 The explosions become bigger and louder, and then more frequent until they almost fill up the entire sky. Your life flashes before your eyes in a matter of seconds (you are just a baby, after all), and you feel the regrets of not having spent more time at the playground. Your diaper is almost bursting. Then, without warning, it all ends. You look around, confused by what just happened. Your parents smile, laugh, clap and ask you things in their sing-song voice, but you don’t understand it. You wonder why they don’t seem to understand how close they were to complete annihilation. You’re too stunned to react to anything. The crowd begins to disperse, and you walk down the street with a group of strangers who, for some reason, can’t seem to walk straight, and you wonder if they were hurt by the colorful sky fire. At some point along the way you cross a group of young men with their shirts off, shouting “U.S.A! U.S.A! U.S.A!” and throwing up onto somebody’s front stoop. That's when you make mental note to have your daddy pay big-time for putting you through this experience. If I did want Kyle to experience fireworks, Saturday would have been the perfect evening for it. After all, we were just a short distance from the largest fireworks display in the country (with Sheboygan, Wisconsin, as a close second). But instead, we did the responsible thing as parents: we chickened out. We figured we would wait until he's a little bit older and can understand us better. That way when I jokingly tell Kyle that the fireworks will set our hair ablaze if we don't dodge them, he'll react appropriately. This was perhaps the least eventful Fourth of July Jennifer and I have ever had. We basically went to the park, ordered takeout for dinner, put Kyle to bed, and then watched the fireworks on TV. There was no going out to eat with friends. No family cook-out. No embarrassing myself in front of my aunts and uncles with my amazing lack of ability to throw a horseshoe. No, the Fourth for us was almost like any other Saturday, with a couple exceptions: the doughnuts we bought that morning had the red, white and blue sprinkles, and the blasting car stereo that woke up the neighborhood did not play rock or hip-hop. Instead, it blared John Philip Sousa's "Stars and Stripes Forever" (I'm not kidding). It all made me feel very patriotic. Changing the way we celebrate holidays is quite an adjustment, as is everything else with having a baby. Eventually we'll live it up, but right now we have to be low-key, since we know that our kid has the skills to drown out the boom of fireworks with his wails. We don't want to ruin the holiday for others. However, this is completely a personal choice. I am glad that we do have the freedom to take our child anywhere we please, even when he's crying, screaming, kicking, thrashing, or just making high-pitched yelps that cause your ears to bleed. Not every country would allow that. It's having that kind of freedom that makes me proud to be an American.